Charcuterie for 500, Please, Alex. From Jane: I am super excited today because I get to introduce you to This Week for Dinner’s first-ever regular contributor (who isn’t me!). Everyone meet Cora Wallin! Cora is my sister-in-law who has been making good food for our family since the day we all met her. She’s an excellent cook who is behind some of my favorite recipes here on the blog (I’m looking at you taco meat, sour cream banana bread and sweet potato burritos with the yummiest black beans ever). Last summer when Cora and I were hanging out at my parent’s house, she was telling me about a few of her recent favorite recipes. I was thinking about how I needed to make them and photograph them so I could share these recipes on the blog, and then I had a genius idea. Cora is both a fabulous writer AND photographer, so, um, that means she can just write these blog posts for me, right? Somehow I got her to agree and now we are all benefitting! (Okay, maybe Cora isn’t benefitting so much, but whatever. She just loves me THAT MUCH.) Cora is kicking things off with a delicious and beautiful post that explains how to do charcuterie at home. Thank you Cora! We had an official #adulting moment last month. We were invited to dinner as a family (including husband Christian, 7-year-old Maddox, 5-year-old Sophie and 8-month-old Phoebe) by one of Maddox’s classmates. Obviously, I’m not a stellar member of the PTA (excuse me, PTO) for this to be our first family-dinner-at-a-classmate’s rodeo. It felt significant. It felt a bit nerve-racking. Would it be an evening of polite and benign conversation while the smelly seven-year-olds made fart jokes at the end of the table or would this be the beginning of family friends? About 30 minutes before show time, I sent the husband out to buy flowers and wine. Which meant we were almost late to a dinner only two blocks away. We arrived dew-kissed (read: sweaty) and slightly winded from the horror of getting three children in and out of coats, hats and shoes. The older kids ran off to destroy our hosts’ home while Christian and I joined the grown-ups on the sofa by the fire. I plopped down onto said sofa with Phoebe clinging to me and became even “dewier” thanks to the romantic, blazing hearth. Then my eyes fell to the coffee table where there upon the altar of friendship was laid mana. Life reviving sustenance. BEHOLD, a cheese board with the all the dressings and trappings of a Pinterest fantasy. Then I knew, I really knew, we would all be fast friends. That’s the power of the charcuterie. It brings fancy salamis and smelly cheeses together on little edible carb-loaded plates and turns everyone into heart-eyed smiling emoji faces. It’s pure magic. It’s how we can heal this world. So let’s break it down Jeopardy style…behold the keys to world peace. Charcuterie is just a snooty french word that means a collection of cured meats. Now, I’ve unsuccessfully attempted charcuteries in the past, but what my new best friends showed me was the key to friendship and charcuterie glory is an assortment. Before I would grab 3 different kinds of meats and it always felt like a bit of a let down when I made the spread. Go for a variety, not quantity. Try rosemary ham, 3 different salamis and a pate or teewurst. Have a mix of sweet, spicy, peppery meats as well as melt-in-your-mouth prosciutto. It’s much better to do a little bit of a lot of things than a lot of just a few. But meat alone won’t do the trick, otherwise my southern cousins’ pepperoni logs and Slim Jims would be the height of social entertaining. The lactose-y wonder of cheese is what makes all those delectable meats sing. Again, it’s all about the the different textures and flavors. Pick up a creamy brie, crumbly blue, smoky gouda and zippy manchego. Each bite should feel like a choose-your-own-adventure book for your mouth. 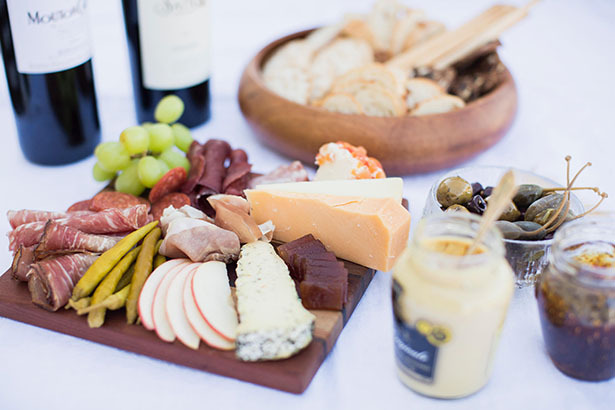 Serve that wonderful meat and cheese on delicious edible plates. And don’t forget, variety, variety, variety! (Are you sick of that theme yet?) Don’t just serve water crackers. Slice up a fresh baguette. Grab some fig and olive crackers at Trader Joe’s. Toss in thin and crunchy breadsticks. The more the merrier. 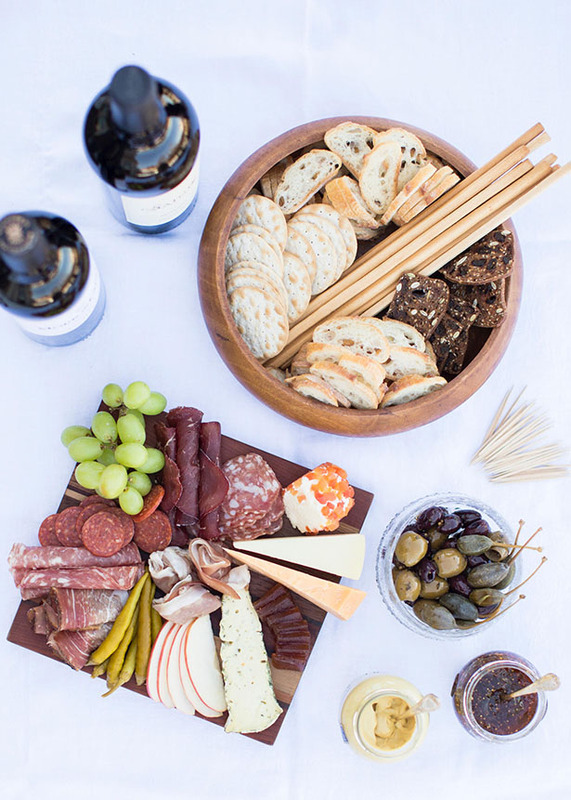 The extras are what will really set your charcuterie and cheese board apart. 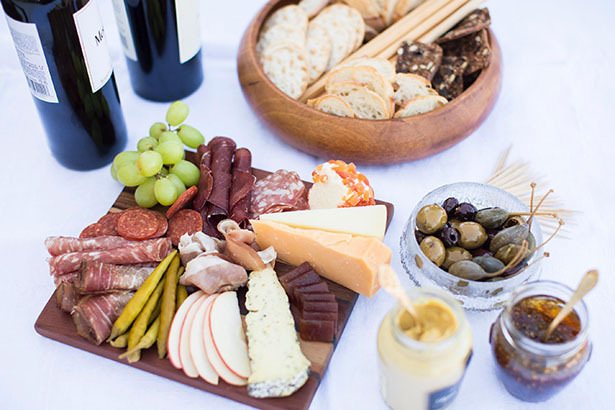 There are SO many amazing options but here are just a few: marinated olives (pitted always feels less awkward), nuts, caper berries, pepperoncinis, roasted peppers, juicy grapes, thin-sliced Granny Smith apples, french dijon mustard, fig preserves, quince or guava paste, fresh honey”¦the list is endless. A great place for ideas can be your local wine shop. Many of them have cheese departments where you can get suggestions for wonderful pairings. Lastly, don’t forget to make it pretty. Put cheese on little squares of parchment. Add fragrant sprigs of fresh herbs. Roll soft cured meats and fan out chorizo slices. 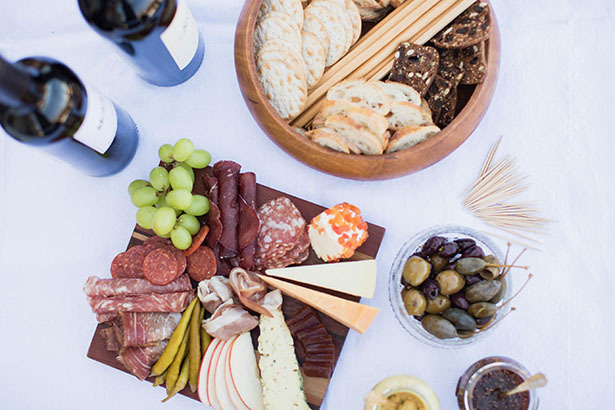 Intermix your groups of meats, cheeses, crackers and extras. Remember this is about coming together. It’s about building bridges of hope and love. Let the cheese show you the way.